May Day, Mayday…Lambs, lambs, lambs! May 1st and a wave of lambing! Six ewes all in labor at once. Ewes arguing over a prime spot to have their lambs, some quietly progressing, one baa-ing like a creature in Jurassic Park. Fortunately, for the shepherds, it was morning and the day was sunny and warm. The barn was cozy and there were jugs(pens for moms with new lambs) set up and waiting for those lambs to be born. Cindy Lou had an adorable badgerface boy on April 28, easing us in to the next wave of lambs. The Teacup , my treasured horned moorit grey ewe, presented us with a trio of ram lambs on April 30th. 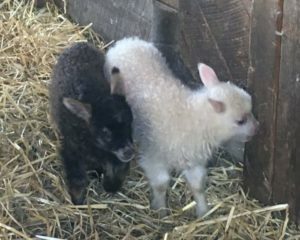 All moorit (brown) lambs, a badgerface, a solid color and a moorit grey. Very nice! Great mom! SO here we are…Iris, a moorit horned ewe, was first to lamb. Twin ewe lambs, one solid moorit and one moorit badgerface. Up and nursing, and then off the jug, mom following along after the lambs I am carrying low to the ground so she can see them. Settled in with hay for mom and a bucket of warm sweet water. On deck is ZuMu, a big moorit horned ewe. She presents us with a beautiful solid black ewe lamb followed by a moorit badgerface ewe. 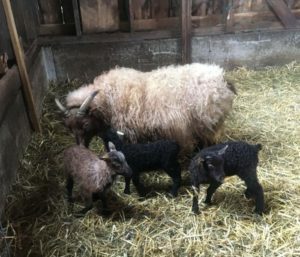 All 4 of our horned adult ewes were bred to a very handsome black badgerface lamb. He did a great job, his moorit gene showing up everywhere! Off to the jug, after a drink and the scale and a dip of iodine to the umbilical cords. That is the ritual, dry off , drink, dip, weigh, and a couple squirts of Baby Lamb Strength (a energy & vitamin rich supplement). Coming right behind was our black horned ewe, who has yet to tell me her name! She delivered a black badgerface ewe was doing a fine job of cleaning her off and the lamb was up and nursing, not much help needed there. She seemed to be done, though I had thought she would have twins. Sóla was now pushing hard and delivering in another corner. So our black ewe was escorted to a jug and settled in. 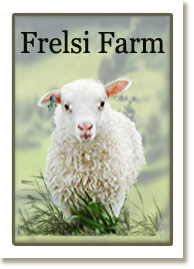 Sóla, a sweet white polled ewe, presented us with a white ewe lamb and a black grey ram lamb. He is so cute! I think he may be a homozygous grey, expressing 2 grey pattern genes. She had not a bit of trouble and though the lambs are small, they are up and nursing all on their own. She liked where she was so we made a jug around her and her family and added new straw and a basket of hay and a special warm water with some corn syrup. They love that and seem to be wary of molasses water. I now remembered that our great big wide as a house ewe, Muffie, had had a water bag out for a while! She has lambed 4 times before and had not trouble, but this was taking too long! After corralling her into a pen, an internal check revealed 2 sets of front feet and one head…twins jammed up. I was baffled, which legs went to which lamb and where was that other head? I finally figured out that the lambs were piggyback and the top lamb’s legs were out straight next to the jaw of the bottom lamb. Sorted out, fortunately with David holding her and she cooperating, all went well and I assisted the first lamb out, a big beautiful polled black mouflon ram. He was followed by a rather stressed solid black ram who took a minute to realize he was out in the world. Both were up and going after a towelling off. Mom’s udder was so full I milked a pint of colostrum off and the boys were up and at the milk bar. Black Spot was now bellowing like a dinosaur! A first time lamber, she was pushing so hard and letting us know this was not fun! The trouble was a very big ram, very black lamb…he was finally out. So glad she is polled, big horn buds on this boy would have been an issue! Black Spot was up on her feet and licking off her lamb. She was tired but okay, and doing a good job. She certainly deserved a nice breakfast and warm drink. The barn was quiet except for the mother sounds of the ewes talking to their lambs. The morning had moved along into afternoon. The sun was warming the barn and there was just a gentle breeze. A good day.